Range: 2.5 - 99,999 RPM; Distance:up to 40 inches; Resolution:0-1000 RPM/0.1RPM; 1,000-9,999 RPM/2.5 RPM; >10,000 RPM (±0.025%+1dgt). Measurement angle:at less than 120 degrees. Sampling Time: 1.0 seconds (over 60 RPM); Memory: Last value, Max Value, Min. Value; Time base: Quartz crystal; Circuit: Exclusive one-chip LSI circuit; Battery: 4 X 1.5V AA. Range: 5 - 19,999 RPM Surface Speed:0.05 to 1,999.9 m/ Minute/(0.2 to 6,560ft/min) Resolution:0.1 RPM (0.5 to 999.9 RPM); 1.0RPM >1,000 RPM Surface Speed: 0.01 m/min (0.05 to 99.99 m/min) Accuracy: +- 0.05 % + 1 digits Time base: Quartz Crystal Memory: Last Value,Max Value,Min Value Range selection: Auto Sampling Time: 1 second (over 6 RPM). Range - 0 to 99,999 rpm; Resolution - 0.1 rpm (0 to 1,000 rpm) 1 rpm (over 1,000 rpm); Display 5 digits large LCD 15mm (0.6"); Accuracy: +- (0.05% + 1digits); Sampling time: 0.5 Seconds (over 120 RPM); Range Select: Auto ranging 2.5 - 99,999 RPM; Memory: Max, Value/ Min, Value/ Last; TOT: Total revolution display; Distance: 50 - 500 mm (Photo). Time base: Quartz Crystal. 5 digits large LCD 15mm (0.6"); Range: 0.5 to 19,999 RPM; Surface speed: 0.05 to 1,999.9 (m/ Min); Resolution:0.1 RPM (0.5 to 999.9RPM); 1.0 RPM >1000 RPM Surface speed: 0.01m/min (0.05 to 99.99m/min); 0.1 m/ Min (over 100m/min); Accuracy: +- 0.05 % + 1 digits; Range selection: Auto ranging; Sampling Time: 0.5 s (over 120 RPM); Power: 4 AA batteries. 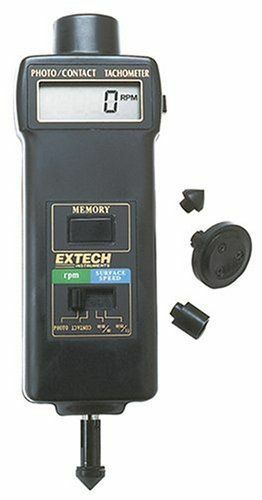 Model: 461995; Type: Combination Contact/Photo Tachometer; RPM Range: 0.5 to 20,000. These meters are used in production areas to measure the speed of gears, fans, pumps and motors. Used for inspection, quality control and the set-up of process machinery.They can either be contact (hooking meter up to shaft) or non-contact (measured with infrared laser) type meters. Model: 461895; Type: Combination Contact/Photo Tachometer. Used for inspection, quality control and the set-up of process machinery. They can either be contact (hooking meter up to shaft) or non-contact (measured with infrared laser) type. These meters are used to measure the speed of gears, fans, pumps and motors. Simply aim the beam at a reflective mark and push the button. Model: 461923; Type: Non-Contact Photo Tachometer; RPM Range: 10 to 99,999; Accuracy: +/-(0.5%rdg+1d). Used for inspection, quality control and the set-up of process machinery. They can either be contact (hooking meter up to shaft) or non-contact (measured with infrared laser) type meters. These meters are used in production areas to measure the speed of gears, fans, pumps and motors. Non-contact photo tachometer rpm measurements for fans, motors and rotating machinery and stroboscopic speed and motion analysis. Accuracy to 0.1%. Stroboscope coarse and fine flash rate adjustment in three ranges to 100,000 flashes per minute. 99,999 rpm with the last Min and Max memory. Premium photo tachometer detects RPM readings with a 0 to 99,999 RPM range. Focused laser beam allows longer detection distance up to 6 feet. Easy to use and with an accuracy rating of +/- 0.05 percent +1 digit. Easy to see 5 digit display with continuous backlighting. Sampling rate of 2 readings per second. Four function digital readout on an easy-to-read, dual display backlit. 249 to 9,990 RPM (+/- 1% accuracy). Advance Degrees (2 and 4 cycle): 0 to 90 (+/- 0.5 max accuracy). Dwell: 0 to 180 / 2-12 cylinders (+/- 1 max accuracy). Patented skip circuitry tests up to 9,990 RPM. Unit can switch from 2-cycle / distributorless (DIS) to 4-cycle / conventional ignition systems. Product description. Patented illuminator optics. Has several times the strobe brightness of typical timing lights. Keeping the large bright spot on the mark is easy. Inductive spark Pickup. Rugged and easy to hookup. Moulded from reinforced, high temperature, etc. Non-contact range 6 to 99,999 RPM and contact range 6 to 25,000 RPM; Accuracy of Resolution: 6.0 - 5999.9 RPM: +/-0.01% and +/-1 digit 5999.9 - 99,999 RPM: +/-0.05% and +/-1 digit Response time: 1 second. Length range: 1 - 99,999(REV). Operating temp. : 32 - 212°F (0 - 50°C), 10 - 90%RH. Laser diode detection with laser sighting and LCD display. Highly accurate, digital laser photo tachometer. High intensity class II laser measures from 2.5 - 99,999 RPM; Extra large 5-digit LCD display, high accuracy of +/- 0.05%; Auto zero adjustment, stores last, minimum, and maximum readings; Measures the rotational speed with a visible red light beam from a powerful LED. Detection distance up to 6 feet. Can be used for HVAC applications in measuring fan speed. The TA100 is two instruments in one a professional microprocessor based contactless digital tachometer and secondary ignition voltage tester. Measures from 200 to 20000 RPM on a 4 1/2 digits display. Advanced microcontroller technology yields / 0.5% accuracy. Auto power off. Secondary Ignition Voltage Tester Features: Instant digital readings from 0 to 40000 Volt. No ground wire connections required. 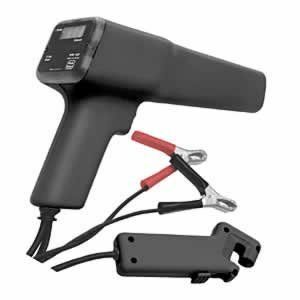 Wireless Digital Tachometer: No sighting of rotating parts or hook-up required. Works on DIS, Conventional, Magneto and most spark ignition system. For 1 to 12 cylinders and 2 or 4 cycle engines Measures from 200 to 20000 RPM on a 4-1/2 digits LCD display Advanced microcontroller technology yields 0.5 % accuracy. Digital Secondary Ignition Voltage Tester: Instant digital readings from 0 to 40000 Volt.